Hearthstone is one of the most popular online card games across the world today. It has a huge fan base, and the game involves strategy, diversity, and wit. Although the concept is as simple as defeating your opponents in a match with the right cards, it can sometimes get too frustrating especially when you participate in competitive ranked matches. It is for this reason why we offer our Hearthstone rank boosting service. Your performance can significantly affect your ranking. If you have suffered consecutive losses due to poor performance, you will end up losing all your acquired stars and go down to the lowest rank. That is where we at ProBoosting enters the picture. If you want to reach Innkeeper or even Legend rank, we can take you there quickly and easily. When you start participating in ranked games, you will begin at rank 25. In between ranks is a stars system that ranges from 2 to 5. This means that after winning your first ever ranked game, your rank is 25 plus one star. In order to reach the next rank, you will need to obtain the maximum star count in your current rank and win one more game. You won’t lose any stars even if you lose stars up to rank 20. However, once you reach rank 20, winning a ranked game will award you with one star and losing will deduct one star. This only means that if you’ve suffered consecutive losses, you’ll end up losing your stars and dropping down to the previous rank. Once you do, you’ll have to continue climbing the ladder even higher. Also, winning two consecutive matches will activate a Winstreak which will disappear once you lose. During a Winstreak, each victory you get will award you two stars. Why Use our Hearthstone Rank Boost Service? 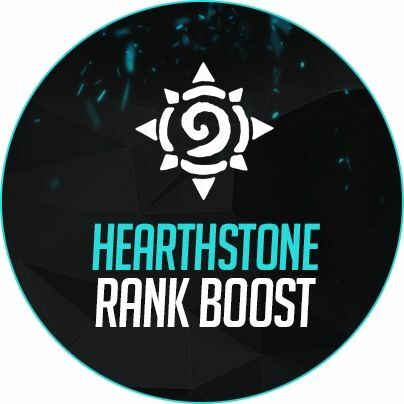 The most obvious reason why you should use our Hearthstone boost service is that you can enjoy guaranteed rank boosting. With a guaranteed boost, you can shoot your way up to the highest rank in the ladder which is the Legend rank. This is made possible since we at ProBoosting has a team of professional Legend level players who will help your account rank up. Another reason why boost your Hearthstone rank through ProBoosting is that we offer quick boosting delivery. Of course, the duration will depend on your current rank and desired rank. On average, we only need approximately 1-3 days to complete your order. If you are rank 16 and want to reach Legend, it will take around 2-3 days. Since Hearthstone has RNG elements involved, some games can end up pretty quickly while some take a bit of time. Since we are performing the boost on your behalf, it only means we can easily rack up some completed challenges and obtain a few card packs as we win games consecutively. However, the packs you can receive will vary. Boosters also create their own decks from your card collection to achieve the highest ranks faster and easier. Apart from our standard Hearthstone boosting service, we also offer additional features in the form of screen sharing. You have the option to have your Hearthstone account rank up without the need to share your account! There are two available options: Skype and TeamViewer. During the boost, you won’t be able to use your PC; however, you can watch the game right in front of your screen! Unlike other games, boosting in Hearthstone is not as relevant since the game has that RNG element to it. It means that the cards are drawn at random, and you’ll never know which card will show up next. However, it does require skills to win consistently and earn stars to rank up. After you provide us with your Hearthstone account details, we make sure to perform the boost as soon as possible. If you are aiming for the Legend rank, your account should have a decent collection and contain at least 1 popular deck in meta.When you start from rank 25, climbing the ladder up to rank 5 can be done in just a day or even a few hours. This is possible by keeping the Winstreak feature active at all times. Once you reach rank 5, the Winstreak feature is immediately disabled and ranking up will become a lot harder. From rank 5, each division will require 5 stars to reach the next. This is actually a difficult feat, and only a few thousand players are capable of reaching Legend at the end of every season. However, our team is made up of skilled players who were all able to reach that level. This gives you the assurance that we can take your account up to the Legend rank. Upon a successful order, we also grant you access to the Member’s Area. Here, you can communicate with your booster, manage your account, and so on.Are you tired of being stuck in the low ranks? What are you waiting for? Avail our Hearthstone boost services now!